I am truly, unabashadely happy with my life right now. Our house is truly beginning to feel like our home. I have a job that I adore. And as always, I'm having a blast with my lifetime partner-in-crime. 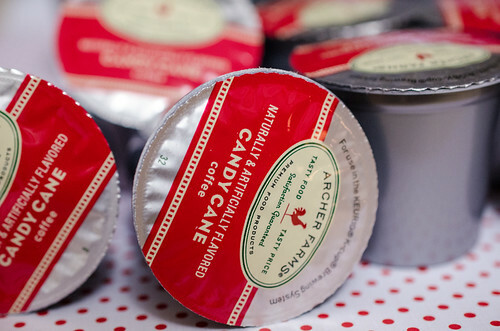 These Candy Cane Coffee K-Cups from Target. I am not even a coffee person, but I've had this every morning for the last week with some Natural Bliss Sweet Cream creamer. So good. 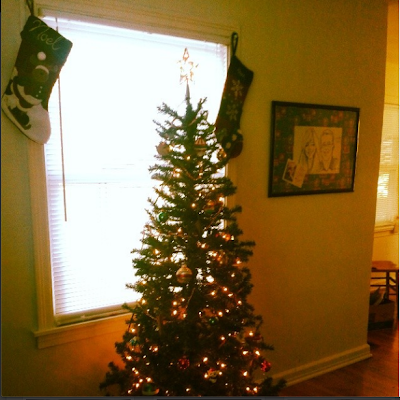 Decorating for Christmas!!! I am not one of those people who insists that Christmas cannot begin until Thanksgiving is over. I hate cold weather, and if celebrating Christmas prematurely is what will get me through the dreary chill of winter, well gosh darnit, I'm going to! The Cartwheel by Target app. Seriously, have I mentioned how much I've been loving Target lately. This app combines two of my greatest shopping loves: Target and couponing! If you haven't downloaded it yet, don't wait a second longer! But most of all, I've been loving all the family time I've had lately. Both with Chuck, and with my sister-in-law and niece. After a Friday night spent at the Columbus Zoo, and a 2-year old's birthday party Saturday afternoon, Chuck and I volunteered our babysitting expertise (ha!) so Chuck's brother and sister-in-law could enjoy a kid-free night. It was a tiring weekend, but getting to cuddle with my husband and niece while we watched The Santa Clause practically made my heart burst! What has been making your heart happy lately? We have those k-cups too and they are DELISH! I SO enjoyed reading this!! It's so funny - I've ALWAYS been one to say, "No Christmas until Thanksgiving is over! You kids need to be thankful BEFORE you start thinking about Christmas gifts!" And this year, Annen and I watched Family Stone together while Loren was in the hospital. Annen was so cute...she said (apologetically), "Sherry, I have to tell you, I broke out some Christmas movies...I was feeling funky - the weather was gray - and I said, 'Oh, what the heck, I'm doing it!' so she watched a Christmas movie and her heart lightened up! I have done the same ever since that night. And you know what? It's OK to break a 30 year tradition. With everything going on in our country right now, the mood is gray. The weather has been...gray. My hubby/BF being the hospital made me feel GRAY. Thinking about Christmas (which caused me to PLAN AHEAD (such a blessing! ), reminded me of all of the incredibly wonderful Christmas' past and helped me get out of this glum, gray time. Your house looks BEEutiful and I hope we get to come over some night in December and sit under your lights with egg nog and REMINISCE about our favorite time of the year. I love you, Kaity the Best Stuckert! OMG so happy for you! !